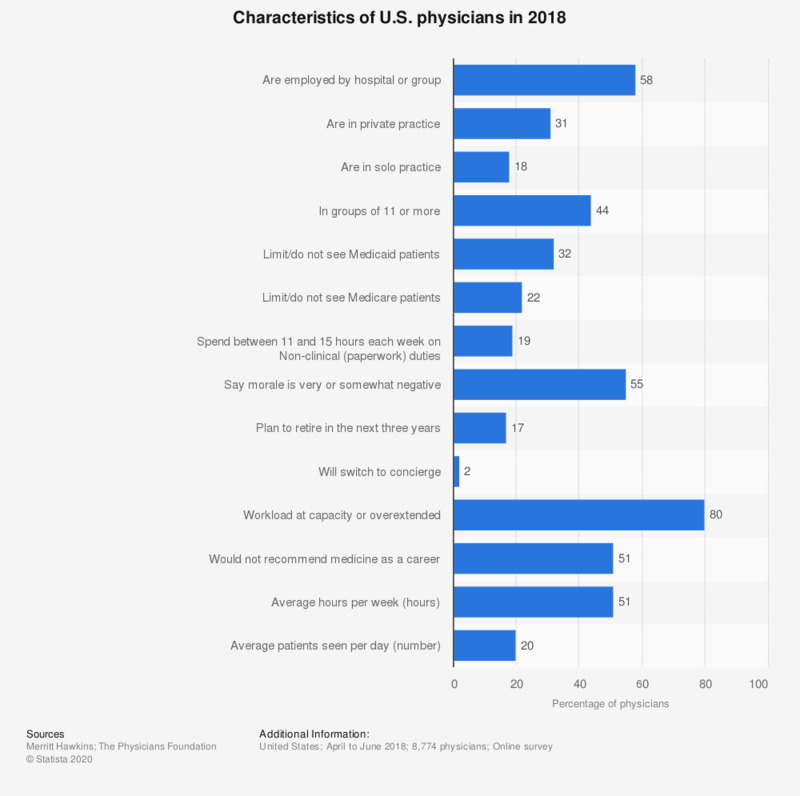 This statistic is based on a survey and provides a portrait of an average physician in the United States, as of 2018. As of that year, the average physician worked about 51 hours per week and 51 percent would not recommend medicine as a career. The characteristics defining a U.S. physician may vary greatly across the country. About 58 percent are employed at a hospital or with a medical group, while about 31 percent are employed at a private practice. Physician compensation can also vary widely based on medical specialty. Those in orthopedics earn about 497,000 U.S. dollars annually, while a physician in critical care earns about 354,000 U.S. dollars per year. As of 2018, California had the largest number of active specialist physicians, totaling 56,220 physicians. About 51 percent of physicians would not recommend medicine as a career, where about 55 percent state that morale is very or somewhat negative due to stressors. About 54 percent of physicians in the country have stated that they have experienced burnout as of 2014. There has been an increased number of stressors such as the lack of a single payer system that has contributed to extensive insurance paper work and a decrease in independence for many physicians as hospitals purchase more private practices. Many, about 80 percent, also state that their workload is at their capacity or even overextended. Only about 11 percent of physicians spend 25 minutes or more with their patients.